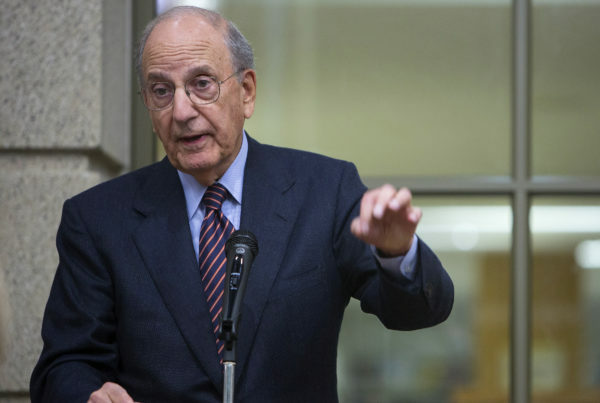 PORTLAND, Maine — Former U.S. Sen. George Mitchell is set to deliver a talk Thursday on the possibility of peace in the Middle East, capping the second annual spring lecture series at the University of New England’s campus in Tangier, Morocco. Mitchell, who served as former President Barack Obama’s special envoy to the Arab-Israeli peace process after representing Maine in the Senate for 15 years, including six years as majority leader, will be the final speaker in UNE’s Tangier Global Forum, which in seven earlier lectures examined the history and contemporary challenges facing the region. The talk comes at a delicate moment for relations between the U.S. and the Arab world. President Donald Trump’s administration has stated a desire to reopen peace talks between Israel and its neighbors — a task that he’s placed in part on the shoulders of his 36-year-old son-in-law, Jared Kushner. But the president’s choice for ambassador to Israel, David Friedman — who had no previous diplomatic experience and expressed hostility toward a two-state solution — has raised concerns in the foreign policy community. The new administration’s efforts to follow through on campaign rhetoric about a Muslim ban and stricter immigration policies have been put on hold by federal judges concerned that they amount to religious discrimination. But that rhetoric and uncertainty about Trump’s stance on Islamic-majority nations have complicated UNE’s efforts to recruit Moroccan students. Anouar Majid, the private school’s vice president for global affairs, recently told the Associated Press that UNE has had to assure Muslim students that the U.S. is a welcoming place. “Several students wearing hijabs wondered whether they would be welcome in the United States, given the election of Donald Trump and the rhetoric they were hearing,” Majid reportedly said.